Rhubarb is one of the best things about spring – a season full of wonderful things. I love it! Mom’s garden always had half a dozen hills of rhubarb. She kept an eye on them every spring until the stems were just the right size and then send a “big kid” out to harvest. She taught us to harvest only about one third of the stems on each plant. When the stems became skinny, around the Fourth of July that meant the harvest season was over and the plant was allowed to replenish itself until the next year. To harvest pull gently on each stem until it gives way and breaks cleanly from the clump. Break or cut off the big floppy leaves and dispose of them. Head for the kitchen, wash each stem and cut into one inch pieces. Cook with sugar until it is soft. Hot or cold – doesn’t matter. Heaven! Wheel’s sister, JayEl*, brought an unusual rhubarb jam to a family dinner last summer. She gifts each of her neighbors with jars of this toothsome treat each summer. When the jars are empty, the neighbors bring their jars back for a refill. Who wouldn’t want to live in that neighborhood?! I was ready to move in after the first taste! When I asked if I could share the recipe, she laughed and said “of course”. I have been patiently waiting and waiting until rhubarb season. Wait no more! *All of our sisters have their initials spelled out here. Our mothers spent hours choosing just the right name for each of our siblings, but hey. . .
Edited to add: After I posted this, I heard from family members that: 1. You can change up the pie filling, to use strawberry or blueberry instead of the cherry. 2. The strawberry version was used as the filling in one niece’s wedding cake, and is about to be used as the filling in a distant cousin’s cake, because she remembered how delicious that cake was! You might also be interested in Sugar Free Strawberry Freezer Jam HERE or Cinnamon Pickles HERE. Slice rhubarb in one inch pieces and place in large saucepan. Add water and cook rhubarb until tender and easily pierced with fork. Add sugar, stirring thoroughly over medium heat. Bring to boil again and cook for 3-5 minutes longer. Stir in cherry pie filling and cook for 6-8 minutes longer, stirring frequently. Pour in jelly jars. Cover and cool, then refrigerate. You can use strawberry or blueberry pie filling instead of the cherry pie filling. The strawberry version was used as filling for a niece's wedding cake - delicious! I’m so glad you stopped by today! Be sure to follow A Pinch of Joy so you don’t miss a thing! Subscribe by email on the sidebar or follow on Facebook, RSS feed, bloglovin’ using the links here or the blue buttons on the header! Follow my pinterest boards here. If you found this helpful, please share on your favorite network by clicking one of the buttons on the bottom of this post. 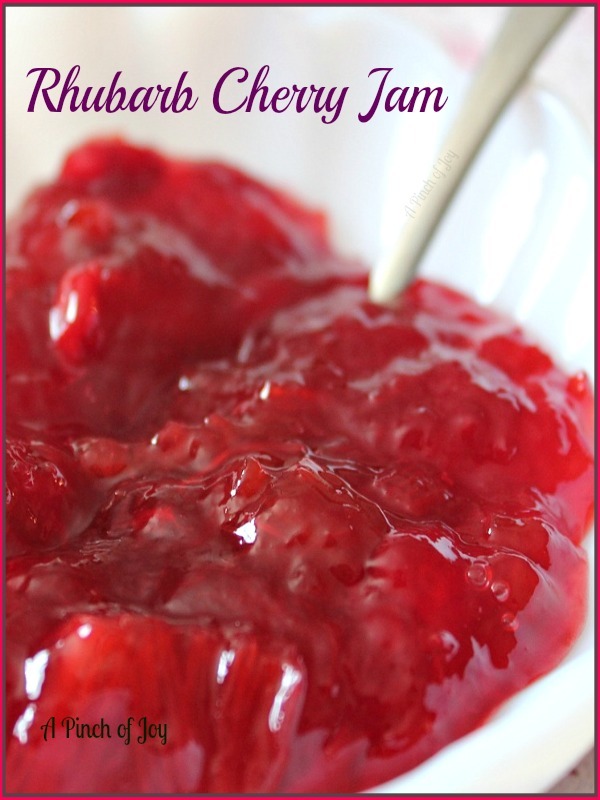 This looks so tasty – I never though t pair rhubarb with cherries – great idea! Thanks so much for linking up on Marvelous Mondays, Charlene! I was already following on Twitter, but now I’m also following on Pinterest and Twitter. Happy Monday!